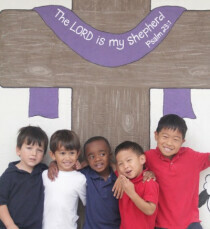 The eternal truths of God’s Word are the foundation of our preschool, its curriculum, and all its activities. Our goal in Christian education is to provide each child with the maximum development of God-given spiritual, physical, and mental abilities. To nurture and strengthen the faith of each child. To provide systematic and thorough instruction in God’s Word. To teach all secular subjects in the light of God’s Word. To strive for excellence in teaching the basic elementary-school curriculum. To provide children with a community in which the principles of God’s Word rule supreme. To give pupils an opportunity to live their faith in daily fellowship. To provide a rich devotional life centered in God’s Word. To support Christian parenthood and home life, the basis of human society. To teach the children to use their time, talents, and treasures to glorify God in faithful service. To encourage pupils to live as obedient citizens of their country. To strengthen the body of Christ and church by training their future members and leaders. The Holy Scriptures are God’s Word and are inspired, inerrant, infallible and supreme in all matters of doctrine and life (2 Peter 1:21; 2 Timothy 3:16; John 17:17; John 10:35). There is only one true God, Father, Son, and Holy Spirit, and He reveals Himself to us in the Holy Scriptures (1 Timothy 2:5; Matthew 3:16, 17; Matthew 28:19). God created all things in six normal days and created man as the crown of that creation (Genesis 1; Psalm 8:4-8). Mankind’s fall into sin has corrupted the nature of every human being, making all people guilty of sin and therefore subject to God’s judgment of eternal damnation (Isaiah 64:6; Romans 3:9-19, 23; Romans 5:12, 16; Romans 6:23). God, through his grace, love, and mercy, sent His only Son, Jesus Christ, to suffer and die to pay for the sins of the whole world (John 3:16; Romans 5:6-8; 1 John 2:2). All who, through the work of the Holy Spirit, believe that Jesus Christ is their Savior receive forgiveness of sins, life, and salvation (Romans 5:1; Romans 8:1; Titus 3:4-7). As a believer in Jesus, a Christian will strive to show love to God by using personal gifts and talents to help spread the Word of God. The Christian will also help fellow Christians and all people in every way that is consistent with God’s Word (Matthew 25:31-46; Matthew 28:19; Psalm 51:10-13, 15; 2 Corinthians 5:14, 15). The Lord has given to parents the primary responsibility for the Christian training of their children (Deuteronomy 6:7-9; Ephesians 6:4). The Lord has also given to His church and every Christian congregation the responsibility to assist parents in the training of their children according to the Scriptures (Matthew 28:20; John 21:15-17; Ephesians 4:11-16). A congregation calls pastors and teachers to function in its midst as ministers of the Word of God (1 Corinthians 12:28; Ephesians 4:11, 12).